Kieran Morris, left, in action for Worcester City against Brackley Town. Leamington boss Paul Holleran has completed his summer business with the addition of defender Kieran Morris from Stafford Rangers. Morris began his career at his local club Stourbridge, captaining the Glassboys’ youth team before being snapped up by Brentford in 2013. He spent two seasons in the Development Squad at Griffin Park, also spending time out on loan at Stourbridge and Maidenhead United, before joining Worcester City in the summer of 2016. A broken hand curtailed his progress there and he was initially dual-registered with Stafford Rangers, establishing himself in the centre of their defence and winning their managers’ player of the season award in 2016/17. He continued to impress for Stafford last season as they won the Staffordshire Senior Cup and is a player Holleran knows well. “He’s someone we’ve seen a fair bit over the last couple of years,” said Holleran of the 23-year-old. Pierpoint and Ben Bailey are still playing. The signing brings Brakes’ close-season additions to five with Morris joining Brad Caswell, James Bowen, Connor Taylor and Matt Stenson in making the switch to the Phillips 66 and Holleran says it “puts the squad where it needs to be”. Training gets under way tomorrow (Saturday) and will be followed by four sessions next week as Leamington build up to the pre-season campaign which kicks off at Racing Club Warwick on July 10. 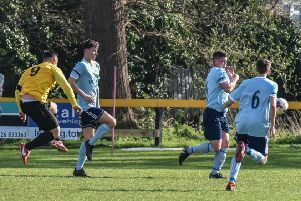 In addition to the new signings, Brakes will be supplemented by one or two potential new faces all trying to impress, including Coventry Sphinx striker Ryan Harkin. Harkin picked up the supporters’ player and players’ player of the year awards after scoring 28 times for the Midland League Premier Division side last term.